Having led the legendary Avon Cities band for many years, trumpet, vibes star Geoff Nichols turns to the swing music of the thirties and forties to present his GOOD VIBES BAND for the discerning jazz fans who require something more than just 'average'. 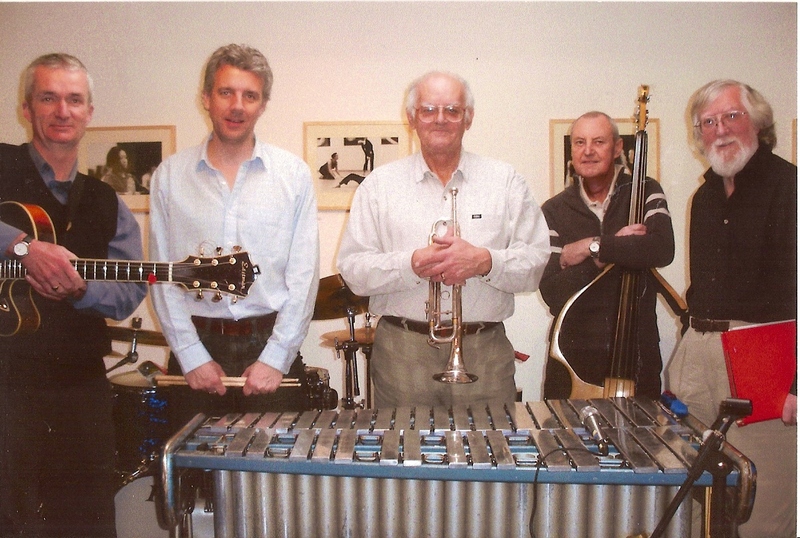 The band's style is built around the wonderful jazz sound of the VIBRAPHONE (or 'vibraharp' as it is known in the United States), supplemented by the swing-style trumpet and horn of the leader. Included in their programme there will always be a selection of the compositions of Gershwin, Porter, Kern, Berlin, etc., plus some of Geoff's own compositions, spiced with a handful of classics from the twenties. 'Jazz Giant, "The Boss', 'Master Musician'...Geoff has been the top swing trumpet and vibes player for a whole generation of jazz fans throughout the West Country. Regularly appears as solo guest artist at The Huntsman, The Farmhouse, The White Horse, etc., and has recently returned from appearing at the Palm Spring Jazz Festival in California. Another ex-Avon Cities musician, Andrew's role in the Good Vibes Band is as a foil to the trumpet and Vibes, and as a jazz soloist in his own right. His professional skills as a leading jazz musician in the area are admirably suited to this ‘frontline role’. A musician of some virtuosity, which provides a natural base for the outstanding rhythm section of THE GOOD VIBES BAND. Every bandleader's favourite bass player, Geoff has overcome serious surgery in the recent past, and is now playing better than ever. The Avon Cities, Excelsior and B.J.M. trio are just some of the bands he has graced. A drummer with a remarkable technique, and understanding of the Swing Style of drumming, he propels the band with flair and drive. Resident at the Undercroft, Bristol with the Blue Notes Jazz Band.